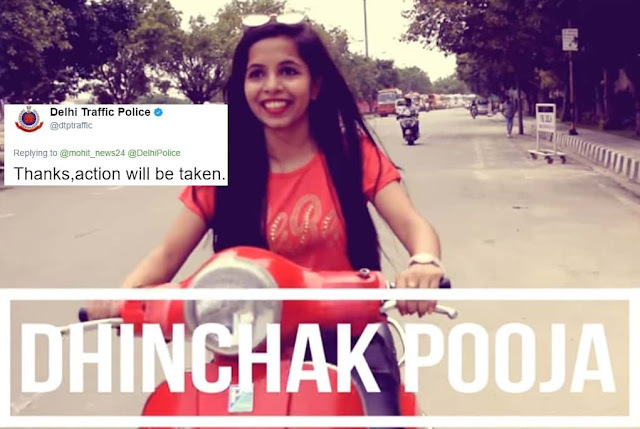 India’s new YouTube sensation Dhinchak Pooja has landed into great trouble with the Delhi Traffic Police and that too because of her latest song 'Dilon Ka Shooter'. In the music video she is seen riding a scooter without wearing helmet and someone unfortunately noticed it. Yes, Mohit Singh of Delhi tweeted about this crime and tagged the official twitter handle of the Delhi Traffic Police. He tweeted in Hindi and when translated into English it would read- “In your context (as in Delhi Traffic Police context) this girl is riding her scooter without her helmet on and singing loudly”. Delhi Traffic Police replied that necessary action will be taken. We are not sure yet if any legal case would be filed until the officials find Pooja’s true identity and what needs to be seen is if any leniency would be granted considering she was just making a video song. What’s to be noted here is that Mohit didn’t reveal anything about the context of this alleged crime, never revealing that the girl was Dhinchak Pooja and that she was making a video song. Dhinchak Pooja took social media by storm and became a YouTube sensation after her song Selfie Maine Le Li Aaj went viral on the video sharing platform. Her other popular songs include 'Swag Wali Topi', 'Daaru Daaru Daaru'. Interviewer - Why should we hire u? Police filed case against Dhinchak Pooja for riding w/o helmet in her video, it's like arresting Mallya for fake rent receipt to save I-Tax. #SalmanKhans "DRIVER" in his car and #Dhinchak_Pooja on the same one way road.